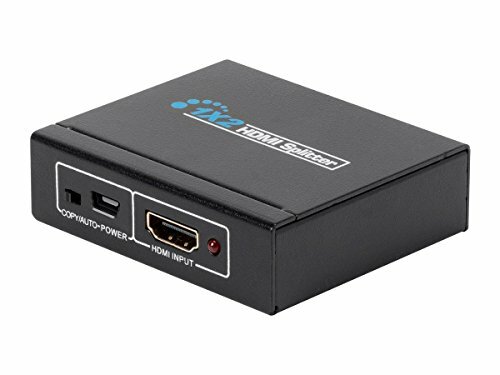 BlackbirdTM 4K Mini USB-Powered 1x2 HDMI Splitter The Monoprice BlackbirdTM 4K USB-Powered 1x2 HDMI Splitter allows you to distribute 4K UHD HDMI video from a single source to two high-resolution displays. Rather than using a proprietary AC power adapter, which can get lost in a move and which requires an open AC power socket, it uses a basic USB connection for its power. This allows you to use a standard USB wall charger, a USB charger integrated into a power strip, or an open USB port on your smart TV or Blu-ray DiscTM player. It supports all HDMI video resolutions up to 4K @30Hz, as well as high-definition, multichannel audio. 4K Ultra HD: Supports all HDMI video resolutions up to 4K @30Hz, including 1080p @60Hz. 2x HDMI Outputs: Distribute 4K UHD HDMI video from a single source to two high-resolution displays. USB-Powered: Rather than using a proprietary AC power adapter, which can get lost in a move and which requires an open AC power socket, it uses a basic USB connection for its power. This allows you to use a standard USB wall charger, a USB charger integrated into a power strip, or an open USB port on your smart TV or Blu-ray DiscTM player. Warranty: Monoprice not only stands behind every product we sell with a 1 year replacement warranty, we offer a 30-day money back guarantee as well! If the product you purchase does not satisfy your needs, send it back for a full refund. 4K Ultra HD: Supports all HDMI video resolutions up to 4K at 30Hz, including 1080p at 60Hz. 2x HDMI Outputs: Distribute 4K UHD HDMI video from a single source to two high-resolution displays. USB-Powered: Rather than using a proprietary AC power adapter, which can get lost in a move and which requires an open AC power socket, it uses a basic USB connection for its power. This allows you to use a standard USB wall charger, a USB charger integrated into a power strip, or an open USB port on your smart TV or Blu-ray Disc player.